Indicate by check mark whether the registrant is a large accelerated filer, an accelerated filer, a non-accelerated filer, a smaller reporting company, or an emerging growth company. See the definitions of "large accelerated filer," "accelerated filer", "smaller reporting company" and "emerging growth company" in Rule 12b-2 of the Exchange Act. The number of shares of common stock, par value $0.001 per share outstanding as of August 6, 2018 was 205,000,000. Convertible Series A preferred stock, $0.001 par value, 200,000 shares authorized; zero and 137,324 outstanding at June 30, 2018 and March 31, 2018, respectively. shares issued and outstanding at June 30, 2018 and March 31, 2018, respectively. Nemaura Medical Inc. (“Nemaura” or the “Company”), through its operating subsidiaries, performs medical device research and manufacturing of a continuous glucose monitoring system (“CGM”), named sugarBEAT. The sugarBEAT device is a non-invasive, wireless device for use by persons with Type I and Type II diabetes and may also be used to screen pre-diabetic patients. The sugarBEAT device extracts analytes, such as glucose, to the surface of the skin in a non-invasive manner where it is measured using unique sensors and interpreted using a unique algorithm. Nemaura is a Nevada holding company organized in 2013. Nemaura owns one hundred percent (100%) of Region Green Limited, a British Virgin Islands corporation (“RGL”) formed on December 12, 2013. 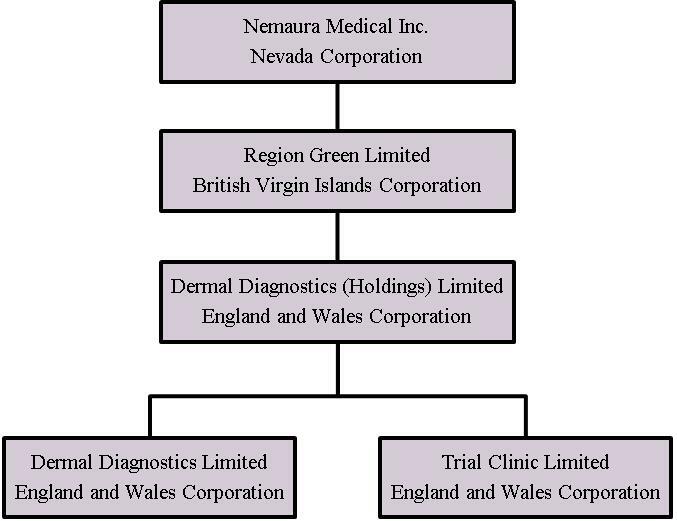 RGL owns one hundred percent (100%) of the stock in Dermal Diagnostic (Holdings) Limited, an England and Wales corporation (“DDHL”) formed on December 11, 2013, which in turn owns one hundred percent (100%) of Dermal Diagnostics Limited, an England and Wales corporation formed on January 20, 2009 (“DDL”), and one hundred percent (100%) of Trial Clinic Limited, an England and Wales corporation formed on January 12, 2011 (“TCL”). DDL is a diagnostic medical device company headquartered in Loughborough, Leicestershire, England, and is engaged in the discovery, development and commercialization of diagnostic medical devices. The Company’s initial focus has been on the development of the sugarBEAT device, which consists of a disposable patch containing a sensor, and a non-disposable miniature electronic watch with a re-chargeable power source, which is designed to enable trending or tracking of blood glucose levels. All the Company’s operations and assets are located in England. The Company has a limited operating history, recurring losses from operations and an accumulated deficit as of June 30, 2018. The Company expects to continue to incur losses from operations at least until clinical trials are completed later this year, when management expects that the product will become available to be marketed. Management has evaluated the expected expenses to be incurred along with its available cash and has determined that there is not substantial doubt as to its ability to continue as a going concern for at least one year subsequent to the date of issuance of these condensed consolidated financial statements. The Company has approximately $320,000 of readily available cash on hand at June 30, 2018 and approximately $4.6 million that will become available in December 2018 (Note 3b). Early withdrawal may generally be made for liquidity needs. - continuing to explore and execute prospective partnering or distribution opportunities. The accompanying consolidated financial statements include the accounts of the Company and the Company’s subsidiaries, DDL, TCL, DDHL and RGL. The consolidated financial statements are prepared in accordance with accounting principles generally accepted in the United States of America, and all significant intercompany balances and transactions have been eliminated on consolidation. The functional currency for the majority of the Company’s operations is the Great Britain Pound Sterling (“GBP”), and the reporting currency is the US Dollar. The Company considers all highly liquid investments purchased with original maturities of three months or less to be cash equivalents. Cash and cash equivalents consist primarily of cash deposits maintained in the United Kingdom. From time to time, the Company's cash account balances exceed amounts covered by the Financial Services Compensation Scheme. The Company has never suffered a loss due to such excess balances. From time to time the Company invests funds in fixed rate cash savings accounts. These accounts, at the time of the initial investment, provide a higher interest rate than other bank accounts, and also require the Company to maintain the funds in the accounts for a period of time, currently $4.6 million through December 2018. Early withdrawal may generally be made for liquidity needs. The Company's financial instruments primarily consist of cash, fixed rate cash accounts, accounts payable and other current liabilities. As of the year-end dates, the estimated fair values of non-related party financial instruments were not materially different from their carrying values as presented, due to their short maturities. The fair value of amounts payable to related parties are not practicable to estimate due to the related party nature of the underlying transactions. Property and equipment is stated at cost and depreciated using the straight-line method over the estimated useful lives of the assets, generally four years for fixtures and fittings. Intangible assets consist of licenses and patents associated with the sugarBEAT device and are amortized on a straight-line basis, generally over their legal lives of up to 20 years and are reviewed for impairment. The Company evaluates its intangible assets (all have finite lives) and other long-lived assets for impairment whenever events or circumstances indicate that they may not be recoverable, or at least annually. Recoverability of finite and other long-lived assets is measured by comparing the carrying amount of an asset group to the future undiscounted net cash flows expected to be generated by that asset group. The Company groups assets for purposes of such review at the lowest level for which identifiable cash flows of the asset group are largely independent of the cash flows of the other groups of assets and liabilities. The amount of impairment to be recognized for finite and other long-lived assets is calculated as the difference between the carrying value and the fair value of the asset group, generally measured by discounting estimated future cash flows. There were no impairment indicators present during the three months ended June 30, 2018 or 2017. The Company may enter into product development and other agreements with collaborative partners. The terms of the agreements may include nonrefundable signing and licensing fees, milestone payments and royalties on any product sales derived from collaborations. The Company recognizes up front license payments as revenue upon delivery of the license only if the license has stand alone value to the customer. However, where further performance criteria must be met, revenue is deferred and recognized on a straight line basis over the period the Company is expected to complete its performance obligations. The Company recognizes the effect of income tax positions only if those positions are more likely than not of being sustained. Recognized income tax positions are measured at the largest amount that is greater than 50% likely of being realized. Changes in recognition or measurement are reflected in the period in which the change in judgment occurs. The Company has elected to classify interest and penalties related to unrecognized tax benefits as part of income tax expense in the consolidated statements of comprehensive loss. The Company does not have any accrued interest or penalties associated with any unrecognized tax benefits, nor was any interest expense related to unrecognized tax benefits recognized for the three months ended June 30, 2018 and 2017. In December 2017, the US Tax Cuts and Jobs Act (the”Act”) was signed into law. Generally, this Act reduces corporate rates from a top rate of 35% to a top rate of 21%, effective January 1, 2018. As the Company’s US operations are minimal, and all deferred tax assets are fully allowed for, there is no significant impact to the Company as of and for the three month period ended June 30, 2018. Basic earnings per share is computed by dividing income available to common stockholders by the weighted-average number of common shares outstanding during the period. There were no potentially dilutive securities as of June 30, 2018 and 2017. For the three months ended June 30, 2018 and 2017, warrants to purchase 10 million shares of common stock were anti-dilutive and were excluded from the calculation of diluted loss per share. The functional currency of the Company is the Great Britain Pound Sterling ("GBP"). The reporting currency is the United States dollar (US$). Stockholders' equity is translated into United States dollars from GBP at historical exchange rates. Assets and liabilities are translated at the exchange rates as of the balance sheet date. Income and expenditures are translated at the average exchange rates prevailing during the reporting period. Adjustments resulting from translating the financial statements into the United States dollar are recorded as a separate component of accumulated other comprehensive loss in stockholders' equity. The Company continually assesses any new accounting pronouncements to determine their applicability. When it is determined that a new accounting pronouncement affects the Company's financial reporting, the Company undertakes a study to determine the consequences of the change to its consolidated financial statements and assures that there are proper controls in place to ascertain that the Company's consolidated financial statements properly reflect the change. In May 2014, the Financial Accounting Standards Board ("FASB") issued Accounting Standards Updates ("ASU") No. 2014-09, Revenue from Contracts with Customers. ASU 2014-09 has been modified multiple times since its initial release. This ASU outlines a single comprehensive model for entities to use in accounting for revenue arising from contracts with customers and will replace most existing revenue recognition guidance in U.S. GAAP when it becomes effective. ASU 2014-09, as amended, becomes effective for annual reporting periods beginning after December 15, 2017. Early adoption is permitted. As an Emerging Growth Company, the Company is allowed to adopt new, or updated, accounting standards using the same time frame that applies to private companies. The Company will adopt this standard on April 1, 2019. Management is currently evaluating the impact of adoption of this ASU on the Company’s consolidated financial statements. In March 2016, the FASB issued ASU No. 2016-02, Leases. The main difference between the provisions of ASU No. 2016-02 and previous U.S. GAAP is the recognition of right-of-use assets and lease liabilities by lessees for those leases classified as operating leases under previous U.S. GAAP. ASU No. 2016- 02 retains a distinction between finance leases and operating leases, and the recognition, measurement, and presentation of expenses and cash flows arising from a lease by a lessee have not significantly changed from previous U.S. GAAP. For leases with a term of 12 months or less, a lessee is permitted to make an accounting policy election by class of underlying asset not to recognize right-of-use assets and lease liabilities. The accounting applied by a lessor is largely unchanged from that applied under previous U.S. GAAP. In transition, lessees and lessors are required to recognize and measure leases at the beginning of the earliest period presented using a modified retrospective approach. This ASU is effective for public business entities in fiscal years, and interim periods within those fiscal years, beginning after December 15, 2018. Early adoption is permitted as of the beginning of any interim or annual reporting period. As an Emerging Growth Company, the Company is allowed to adopt new, or updated, accounting standards using the same time frame that applies to private companies. The Company will adopt this standard on April 1, 2020. Management is currently evaluating the impact of adoption of this ASU on the Company’s consolidated financial statements. The Company is in the development stage of one primary product that it expects to introduce to the UK market after completion of clinical trials and CE mark approval (European Union approval of the product). The Company has entered into sales and marketing agreements for the product. It has also placed orders for the first commercial batch of transmitter devices with the electronics manufacturer Datalink Limited. It has not entered into exclusive manufacturing agreements with any of its contract manufacturers. Uncertainties still exist with regards to regulatory acceptance of the Company’s primary product development efforts and if acceptance is attained, the cost structure to produce the final product. On October 5, 2017, the Company entered into common stock exchange agreements with each of its three largest shareholders, to exchange, in the aggregate, 137,324,000 shares of the Company’s common stock for 137,324 shares of Series A Convertible Preferred Stock. Each share of Series A Convertible Preferred Stock is convertible into 1,000 shares of the Company’s common stock, automatically upon the occurrence of all of certain triggering events, as set forth in the Certificate of Designation, namely (a) the sugarBEAT® device to be commercialized has CE regulatory approval; (b) retail sales having commenced; and (c) retail sales exceeding USD$5 million, inclusive of advanced sales or voluntarily by the holder after February 7, 2018, if these triggering events have not occurred. Each holder of issued and outstanding Series A Convertible Preferred Stock is entitled to a number of votes equal to the number of shares of common stock into which the Series A Convertible Preferred Stock is convertible. Holders of Series A Convertible Preferred Stock are entitled to vote on any and all matters presented to stockholders of the Company, except as provided by law. The Series A Convertible Preferred Stock has no preference to the common stock as to dividends or distributions of assets upon liquidation or winding up of the Company (which has been agreed to by the holders of the Series A Convertible Preferred Stock). The Company determined that the fair value of the preferred shares issued for the common shares was equivalent to the fair value of the common shares exchanged. On November 6, 2017, the transaction was consummated and 137,324,000 shares of common stock were cancelled. As a result, the Company had 67,676,000 shares of common stock issued and outstanding as of March 31, 2018. On June 5, 2018, the three holders of our Series A Convertible Preferred Stock (the “Series A Preferred”) each delivered notices of conversion to voluntarily convert their Series A Preferred, in the aggregate amount of 137,324 of Series A Preferred shares, into 137,324,000 shares of our common stock. The holders had the right to voluntarily convert each share of Series A Preferred into 1,000 shares of common stock of the Company. As a result of the conversion, we have 205,000,000 shares of common stock outstanding as of June 30, 2018. On June 27, 2018, the Company entered into a Master Services Agreement with World Wide Holdings, LLC DBA Invictus Resources, pursuant to which for an initial three month term, Invictus shall provide services related to advising and assisting company in developing and implementing appropriate plans and materials for presenting the Company and its business plans, strategy and personnel to the financial community, introducing the Company to the financial community through the use of social media, digital media and other online awareness campaigns. The aggregate fees in the amount of $160,000 are payable to Invictus during the initial three month term. On July 23, 2018 the Board of Directors approved the issuance of a warrant to Invictus exercisable for 75,000 shares of common stock at an exercise price of $0.01 per share. In March 2014, the Company entered into an Exclusive Marketing Rights Agreement with an unrelated third party, that granted to the third party the exclusive right to market and promote the sugarBEAT device and related patches under its own brand in the United Kingdom and the Republic of Ireland, the Channel Islands and the Isle of Man. The Company received a non-refundable, up front cash payment of GBP 1,000,000 (approximately $1.320 million and $1.294 million as of June 30, 2018 and March 31, 2018 respectively) which is wholly non-refundable, upon signing the agreement. As the Company has continuing performance obligations under the agreement, the up front fees received from this agreement have been deferred and will be recorded as income over the term of the commercial licensing agreement beginning from the date of clinical evaluation approval. As the Company expects commercialization of the sugarBEAT device to occur in the year ending March 31, 2019, approximately $66,000 of the deferred revenue has been classified as a current liability. In April 2014, a Letter of Intent was signed with the third party which specified a 10 year term and in November 2015, a Licence, Supply and Distribution agreement with an initial 5 year term was executed. The Company grants the exclusive right to market and promote its product in the United Kingdom and purchase the product at specified prices. In May 2018, the Company signed a full commercial agreement with Dallas Burston Ethitronix Limited for all other European territories as part of an equal joint venture agreement. The joint venture intends to seek sub-license rights opportunities to one or more leading companies in the diabetes monitoring space, to leverage their network, infrastructure and resources. Nemaura Pharma Limited (Pharma) and NDM Technologies Limited (NDM) are entities controlled by the Company’s majority shareholder, D F.H. Chowdhury. In accordance with the United States Securities and Exchange Commission (SEC) Staff Accounting Bulletin 55, these financial statements are intended to reflect all costs associated with the operations of DDL and TCL. Pharma has invoiced DDL and TCL for research and development services. In addition, certain operating expenses of DDL and TCL were incurred and paid by Pharma and NDM which have been invoiced to the Company. Certain costs incurred by Pharma and NDM are directly attributable to DDL and TCL and such costs were billed to the Company. Management believes the allocation methodologies used are reasonable. DDL and TCL advanced Pharma certain amounts to cover a portion of the costs. Following is a summary of activity between the Company and Pharma and NDM for the three months ended June 30, 2018 and 2017. These amounts are unsecured, interest free, and payable on demand. These amounts are included primarily in research and development expenses charged to the Company by Pharma. The Company routinely reviews its statement of cashflows presentation of related party transactions for financing or operating classification based on the underlying nature of the item and intended repayment. Total amounts charged to the Company by Pharma and NDM were $521,085 and $95,617 for the three months ended June 30, 2018 and 2017 respectively. The Company has experienced recurring losses and negative cash flows from operations. At June 30, 2018, the Company had approximate cash and fixed rate cash account balances of $4,941,000, working capital of $4,123,000, total stockholders' equity of $3,113,000 and an accumulated deficit of $9,736,000. To date, the Company has in large part relied on equity financing to fund its operations. Additional funding has come from related party contributions. The Company expects to continue to incur losses from operations for the near-term and these losses could be significant as product development, regulatory activities, clinical trials and other commercial and product development related expenses are incurred. • developing the sugarBEAT device for commercialization. There was no revenue recognized in the three months ended June 30, 2018 and 2017. In 2014, we received an upfront non-refundable cash payment of GBP 1 million (approximately $1.320 and $1.294 million at June 30, 2018 and 2017, respectively) in connection with an Exclusive Marketing Rights Agreement with an unrelated third party that provides the third party the exclusive right to market and promote the sugarBEAT device and related patch under its own brand in the United Kingdom and the Republic of Ireland. We have deferred this licensing revenue until we complete our continuing performance obligations, which include securing successful CE marking of the sugarBEAT patch, and we expect to record the revenue in income over an approximately 10 year term from the date CE marking approval is obtained. Although the revenue is deferred at June 30, 2018, the cash payment became immediately available and was being used to fund our operations, including research and development costs associated with obtaining the CE marking approval. Research and development expenses were $429,539 and $149,198 for the three months ended June 30, 2018 and 2017, respectively. This amount consisted primarily of expenditures on sub-contractor activities, consultancy fees and wages and demonstrated continuing expenditure for improvements made to the sugarBEAT device. The increase of $280,341 is due to increases in these costs as the sugarBEAT product is nearing completion. General and administrative expenses were $342,424 and $268,122 for the three months ended June 30, 2018 and 2017, respectively. These expenses consisted primarily of fees for legal, professional, audit services and wages. We expect general and administrative expenses to remain at similar levels going forward in the long term, as there will continue to be professional, consultancy and legal fees associated with planned fundraising. For the three months ended June 30, 2018 and 2017, other comprehensive (loss)/income was ($234,609) and $202,755 respectively, arising from foreign currency translation adjustments. We have experienced net losses and negative cash flows from operations since our inception. We have sustained cumulative losses of $9,736,239 through June 30, 2018. We have historically financed our operations through the issuances of equity and contributions of services from related entities. At June 30, 2018, the Company had net working capital of $4,122,774 which included cash and short-term fixed rate cash account balances of $4,941,042. The Company reported a net loss of $763,154 for the three months ended June 30, 2018. While our current cash level (including fixed rate cash accounts) is sufficient for the completion of the clinical studies and the initial scale up of our manufacturing, our long term business plan is contingent upon our ability to raise additional funds. This may include a combination of debt, equity and licensing fees. If we are not successful in raising the funds needed in the specified timelines, the target dates for the achievement of the milestones will be extended. – Establish commercial manufacturing operations for commercial supply of the sugarBEAT device and patches. – Complete clinical studies for CE approval of the body worn miniaturised device with Bluetooth connectivity. In November 2015, we received proceeds of $10,000,000 in connection with the private placement of 5 million shares and warrants for up to 10 million shares of our common stock. The warrants have an exercise price of $0.50 per common share and expire on January 25, 2023. Net cash consumed by our operating activities for the three months ended June 30, 2018 was $440,457 which reflected our net loss of $763,154, and offset by an increase in accounts payable, liability due to related parties and accrued expenses of $444,639, and increased by an increase in prepayments and other receivables of $128,718. Net cash consumed by our operating activities for the three months ended June 30, 2017 was $287,966 which reflected our net loss of $407,787, and offset by an increase in accounts payable, liability due to related parties and accrued expenses of $127,766, and increased by an increase in prepayments and other receivables of $13,014. Net cash consumed by investing activities was $9,865 for the three months ended June 30, 2018, which reflected the expenditures made in developing intellectual property, primarily related to patent filings. Net cash realised by investing activities was $635,092 for the three months ended June 30, 2017, which reflected $647,450 returned from the maturity of a fixed rate savings account, but reduced by the expenditures made in developing intellectual property, primarily related to patent filings of $12,358. For the three months ended June 30, 2018 and 2017, there were no cash flows from financing activities. Research and Development Expenses: The Company charges research and development expenses to operations as incurred. Research and development expenses primarily consist of salaries and related expenses for personnel and outside contractor and consulting services. Other research and development expenses include the costs of materials and supplies used in research and development, prototype manufacturing, clinical studies, related information technology and an allocation of facilities costs. The Company recognizes the effect of income tax positions only if those positions are more likely than not of being sustained. Recognized income tax positions are measured at the largest amount that is greater than 50% likely of being realized. Changes in recognition or measurement are reflected in the period in which the change in judgment occurs. The Company has elected to classify interest and penalties related to unrecognized tax benefits as part of income tax expense in the consolidated statements of comprehensive loss. Intangible Assets: Intangible assets primarily represent legal costs and filings associated with obtaining patents on the Company's new discoveries. The Company amortizes these costs over the shorter of the legal life of the patent or its estimated economic life using the straight-line method. The Company tests intangible assets with finite lives upon significant changes in the Company's business environment and any resulting impairment charges are recorded at that time. The Company recognizes up front license payments as revenue upon delivery of the license only if the license has stand-alone value to the customer. However, where further performance criteria must be met, revenue is deferred and recognized on a straight-line basis over the period the Company is expected to complete its performance obligations. The Company’s exposure to interest rate risk is minimal. We have no bank borrowings and, although we have placed funds on deposit to earn interest during the year, these are of fixed-term and fixed-rate and therefore offer little exposure to interest rate risk. Our foreign currency exposure gives rise to market risk associated with exchange rate movements against the US dollar, our reporting currency. Currently, the majority of our expenses and cash and fixed rate deposits are denominated in Pounds Sterling, with the remaining portion denominated in US dollars. Fluctuations in exchange rates, primarily the US dollar against the Pound Sterling, will affect our financial position. At June 30, 2018, the Company held approximately $5 million in GBP-denominated bank and fixed rate cash accounts. Based on this balance, a 1% depreciation of the Pound against the US dollar would cause an approximate $50 thousand reduction in cash and fixed rate deposit account balances. We have not utilized any hedging instruments in order to mitigate the foreign currency risk. Historically, with UK inflation rates having been low in recent years, inflation has not had a significant effect on our business in the UK, the location of the substantial part of our activities. Dr. Dewan F.H. Chowdhury, who is our Chief Executive Officer and Mr. Iain S. Anderson, who is our Principal Financial and Accounting Officer, have evaluated the effectiveness of our disclosure controls and procedures as of the end of the period covered by this Quarterly Report on Form 10-Q. The term "disclosure controls and procedures," as defined in Rules 13a-15(e) and 15d-15(e) under the Securities Exchange Act of 1934, as amended (the "Exchange Act"), means controls and other procedures of a company that are designed to ensure that information required to be disclosed by a company in the reports that it files or submits under the Exchange Act is recorded, processed, summarized and reported, within the time periods specified in the SEC's rules and forms. Disclosure controls and procedures include, without limitation, controls and procedures designed to ensure that information required to be disclosed by a company in the reports that it files or submits under the Exchange Act is accumulated and communicated to the Company's management, including its principal executive and principal financial officers, as appropriate to allow timely decisions regarding required disclosure. Management recognizes that any controls and procedures, no matter how well designed and operated, can provide only reasonable assurance of achieving their objectives and management necessarily applies its judgment in evaluating the cost benefit relationship of possible controls and procedures. Based on this evaluation, management concluded that our disclosure controls and procedures were not effective as of June 30, 2018, at the reasonable assurance level due to a material weakness in our internal control over financial reporting, which is described below. As of June 30, 2018, our management, with the participation of our Principal Executive Officer and Principal Financial Officer, evaluated our internal control over financial reporting. Based on that evaluation, our Principal Executive Officer and Principal Financial Officer concluded that no changes in our internal control over financial reporting occurred during the quarter ended June 30, 2018 that have materially affected, or are reasonably likely to materially affect, our internal control over financial reporting. As described in our Annual Report on Form 10-K for the year ended March 31, 2018, management assessed the effectiveness of our internal control over financial reporting as of March 31, 2018. In making this assessment we used the criteria set forth by the Committee of Sponsoring Organizations of the Treadway Commission (COSO) in Internal Control – Integrated Framework (2013). As a result of its assessment, management identified material weaknesses in our internal control over financial reporting. Based on the material weaknesses as described below, management concluded that our internal control over financial reporting was not effective as of March 31, 2018. Accordingly, our internal control over financial reporting is not effective as of June 30, 2018 because of the material weaknesses identified and described below. · there is a lack of access controls and documentation over the Company’s IT applications which could result in the improper initiation and reporting of significant transactions. · Management has identified that there is a lack of adequate financial expertise related to the assessment of complex transactions and a lack of adequate resources to review out of the ordinary transactions and arrangements of the Company. This could result in the improper reporting of significant transactions or arrangements. · Related party transactions. Specifically, there are limited policies and procedures to ensure that financial statement disclosures reconcile fully to the underlying accounting records and that Board approval of these transactions is not documented. · Assembling a team from our finance department to be responsible for the preparation of financial statements under U.S. Securities laws, including hiring additional qualified personnel such as a CFO with US listed company experience. · In assembling this team, the Company will put in place controls to segregate duties in the processing of key transactions, controls to ensure the review and approval of journal entries and controls to ensure that access to IT systems is limited to authorized users and adequately documented based on the applications and their functions within the organization. · We have continued to engage with a third party consulting firm to help us assess our current internal control over financial reporting against COSO 2013, as well as identifying a gap analysis, suggest improvements in controls, and assist us in testing our control systems. Further testing has occurred of certain controls, including purchasing processes, payment processes, and month end closing procedures. In addition, an initial assessment of IT general controls has been conducted, with a view to assessing the current situation and strengthening these controls where deemed necessary. The Company has set a target to design and implement controls that will address the material weaknesses by March 31, 2019. The independent advisers have agreed to a table of work to complete all controls reviews, implementation and testing in this timeframe and the Company has committed to meeting this timeframe. However, as this process is ongoing and there will need to be sufficient time to ensure implemented controls are operating effectively, there is no assurance that all material weaknesses will be fully remediated by March 31, 2019. · Continuing to develop and formalize the activities of the audit committee. The committee will be helped by an outsourced internal audit department to review our internal control processes, policies and procedures to ensure compliance with the Sarbanes-Oxley Act of 2002. · Ongoing assessment of our current Internal Control Over Financial Reporting against COSO 2013 and the requirements set forth by Sarbanes-Oxley Act section 404. This task will be conducted by an independent expert. · Continued testing of the operating effectiveness of the controls that have been identified and implemented in order to prevent misstatement of the financial statements. In addition, the Company will focus on the design and implementation of Key Performance Indicators (KPIs) in order to measure the quality of the processes in place, and the efficiency of the controls. Certain aspects of this plan were implemented in the year ended March 31, 2018 and other aspects are expected to be implemented on, or around, the time that we are prepared to take our sugarBEAT product to market. Further information regarding our remediation plans is contained in our Annual Report on Form 10-K for the year ended March 31, 2018. While we are continuing to address these issues, we have not completed any of these remedial actions as of the date of this report. Certification by Chief Executive Officer (Principal Executive Officer) pursuant to Section 302 of the Sarbanes-Oxley Act of 2002. Certification by Chief Financial Officer (Principal Financial and Accounting Officer) pursuant to Section 302 of the Sarbanes-Oxley Act of 2002. Certification by Chief Executive Officer (Principal Executive Officer) pursuant to 18 U.S.C. Section 1350, as adopted pursuant to Section 906 of the Sarbanes-Oxley Act of 2002. Certification by Chief Financial Officer (Principal Financial and Accounting Officer) pursuant to 18 U.S.C. Section 1350, as adopted pursuant to Section 906 of the Sarbanes-Oxley Act of 2002.